Something odd happened to me the other day while listening to my iPod. I was enjoying a bootlegged version of Jerry Goldsmith’s magnum opus, the score to the first Star Trek motion picture. One of the tracks is raw recording session featuring two takes of the now-famous main title. The theme was just getting going when, at the 1:26 mark, it just stopped playing. The music went silent and the time counter stopped moving. The iPod itself wasn’t frozen. I could still skip to the next track, navigate menus, play other songs, etc, but this one file would not play all the way through. The song played fine in iTunes and Quicktime Player, but for some reason, my iPod didn’t like it. Using my troubleshooting “shinn” I surmised that the problem was with the file itself. In the past when I encountered problem mp3 files, usually the result of trying to play Windows-created files on my Mac, I turned to a little utility called MusicVac. The program cleared all the gunk out of the file, bad headers, corrupted ID3 tags, resource forks, etc, leaving behind a fresh mpeg stream. 99% of the time, MusicVac made the unplayable playable, succeeding where countless other apps failed. Unfortunately for me, I couldn’t find the program in any of my software archives. It must have been lost in a hard drive crash or during the move from one computer to another over the years. So off to Google I went, but I wasn’t hopeful. This program was written for Mac OS 9 and I’d not heard of any updates since 1999 or so. Indeed the first few links pointed to a dead dhs.org site and everything else pointed to pages that looked like they hadn’t been updated since 1998. It took a better part of the evening and more search strings than I can remember, but I finally found a downloadable copy, link intact, on an Italian ftp server. After moving the program and the troublesome mp3 to my G4 PowerBook (had to run in Classic and Classic doesn’t work on Intel Macs), I proceeded to “vacuum” the file. A few seconds later, I had a brand new mp3, that I’m happy to report works just fine on my iPod. Because MusicVac was so hard to track down and development seems to have ceased, I’ve decided to host a copy of it here. As I noted above, Classic or a booted version of OS 9 is required to use it. Sorry, Intel Mac users. The feature set from the Read Me is below. Removal of leading and ending spaces in file names. Save information about your MPEG files to a text file for easy viewing. Creation/modification of ID3 and ID3v2 tags. Under VERY rare circumstances MusicVac can damage a file when removing a header – usually if the header is corrupt. If this happens, you can try to recover the file by dragging it to MusicVac while holding the command and control keys. You will most likely never need to do this. ID3 editing works like this – MusicVac assumes the filename for the song title. 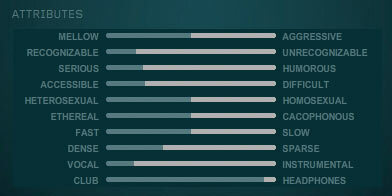 If an ID3 tag already exists, it’s values are inserted into the fields automatically. If you click the "Recall Previous Entries" button (command-R), it will insert the artist and album you last entered. If you click "Skip", no ID3 information will be changed/added to this file. If you option-click "Skip", no ID3 information will be asked the rest of the current MusicVac session. 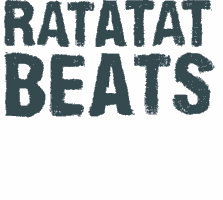 It’s a bit of a cosmic coincidence that I happen to be on a huge Ratatat kick right now and a new Ratatat bootleg has happened to suddenly surface around the net. It’s titled 9 Beats and is apparently a rare look at the band’s early/demo work. How early? It doesn’t say, but it probably pre-dates their 2004 debut. The tracks on the album aren’t songs per se. 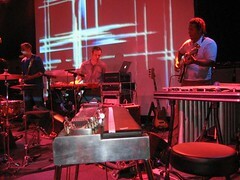 They’re mostly extended loops of beats and melodies that last between one and two minutes. Then, just as you’re starting to really get into them, they just stop. Most of the unnamed tracks don’t even get a fade out. Banagale has more info. Beat #1 is used for Memphis Bleek’s Alright. Beat #2 is used for Young Buck’s Shorty Wanna Ride. Beat #3 is used for Notorious B.I.G.’s Dead Wrong. Beat #4 is used for Young Buck, T.I. & Ludacris’s Stomp. Beat #6 is used for Slim Thug, Bun B, and T.I.’s 3 Kings. 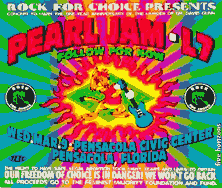 On the evening of March 9, 1994 I attended my first and only Pearl Jam concert at the Pensacola Civic Center in, you guessed it, Pensacola Florida (where PJ guitarist Mike McCready happens to have been born). I was a freshman in high school at the scampy young age of 15 and, having just discovered the full breadth of grunge six months before, I reveled in the notion that one the top bands in the scene would be swinging through my podunk. Anyway, the Pearl Jam show rocked. However, the occasion that brought them did not. This show was held as a benefit in response to the murder of Dr. Gunn by an anti-abortion nutjob in pensacola the previous year and is an early example of pearl jam’s nascent politicism. Dr. Gunn’s death was also one in a series of news stories that garnered national attention for pensacola, but always in a negative spotlight, including a second doctor killing, hurricane ivan and the pensacola: Wings of gold tv show. I remember in the weeks before the show, there were rumors about L7, who were opening for Pearl Jam and there was a constant buzz about more religious nutjobs issuing death threats and staging a massive protest of the concert. Despite that, or maybe because of it, the show was a huge community event. I stood in line for hours on a cold february morning with my dad at a ticketing booth on pensacola nas hoping that the show wouldn’t sell out before our chance to buy tickets. We did, thankfully, manage to get a couple, even though the show was the fastest selling concert in the history of the city at the time. By the day the show arrived, the excitement was palpable. There were additional rumors that the band had been spotted at a local guitar shop. This was never confirmed though. That afternoon brought one of Pensacola’s notorious thunderstorms, which continued until almost show time. This had the effect of dampening the enthusiasm of any would-be protesters. However, security at the Civic Center was still heightened; Everyone going in had to show their ticket and empty their pockets to prove that they were not carrying any weapons. I had arrived late, taking my seat at the rear of the venue as the first opening band, Follow for Now, concluded its set. My seat may have been in the back of the venue, but I had a direct view of the center of the stage and a wide vantage point from which to observe the entire experience. I swear I’ve never seen as many people inside the Civic Center as I did that night at the largest Rock for Choice concert ever held. Download pearl jam live in pensacola.